Its been around six months since the phone call you received at 2 a.m. You and Gerald still talk, quite a lot actually. Anytime he needs someone to talk to, you&apos;re there. If you need someone, he&apos;s there. You&apos;ve become so close and the crazy thing is you don&apos;t even know what he looks like. All you know is is his name. Of course the things you&apos;d expect to come up in a conversation do. You know, where you live, your age, favorite things, etc. You sat on your couch flipping though the channels, so far nothing has caught your eye. You settled on &apos;The Big Bang Theory&apos; letting out a long sigh as you tossed the remote on to the cushion next to you. You propped your feet on the coffee table and set your phone on your thigh. Your phone let out a small &apos;bing&apos; You picked it up and saw a text from Gerald. &apos;I&apos;m coming to see you.&apos; A smile appeared on your face as you filled with joy. Again, even know you didn&apos;t know what he looked like you still became really close to him. Gerald was someone you could always turn to. He became a bestfriend. &apos;Yes ma&apos;am, I should arrive tomorrow around noon so be ready.&apos;  At this point you couldn&apos;t contain you excitement. You were beyond thrilled. You woke up pretty early considering the time you went to sleep. You headed into the bathroom and took a shower, you got dressed and walked back into your bedroom drying your hair with a towel. You smiled to yourself as you remembered Gerald would be coming today. You sat at your vanity table and put on some foundation, powder, and light coat of mascara. You went down to the kitchen and fixed yourself a bowl of cereal. &apos;Hey dorkess, whats your address?&apos; You smiled as you read the text from Gerald. &apos;Soon x&apos; You got up and put your bowl in the sink and sat on a chair in the living room. You opened the spotify on your laptop and began playing some musicto pass time. Your heart was racing, you felt sick, but a good kind of sick. You had to stop and take a few breaths every now and then to calm yourself. All this time and you were finally going to meet one of the closest people in your life. You picked up your phone checking the time. 12:34 p.m. You jumped as you received a text. &apos;I&apos;m like a few minutes away.&apos; You began pacing the room. "Is he as nervous to meet you as you are to meet him?" You thought. So many things began running through your mind. You kept imagining what he&apos;d look like when you meet him. You pulled back to reality by a knock on the front door. You took one last deep breath as you placed your hand on the door knob. You slowly opened the door to see a very tall, very handsome man standing on your porch. "Y/n?" He asked look you in the eyes. You nodded as you got the biggest grin on your face. He walked towards you wrapping his arms  around your waist. You breathed in his sent, He was nothing like you imagined. He was more beautiful. "I&apos;m so happy to finally meet you." He said still not letting go. You hugged for what was probably a solid two minutes. After you too finally let go you walked into the kitchen. "Are you thirsty?" You asked pulling to glasses out of the cabinet. "Water, tea, soda.." You trailed off. "Waters fine. "He said coming into the kitchen and sitting at the island. You sat across from him and placed the glass in front of him. You guys started talking about anything and everything. "Why do you keep staring at me like that?" Gerald grinned taking a drink. "I swear to god I&apos;ve seen you before." You laughed. "Well it could be because I&apos;m G-Eazy." He said raising an eyebrow. "Nah, it&apos;s all good. 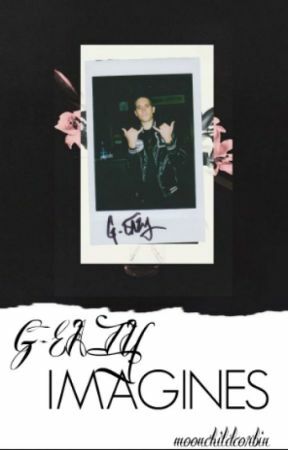 I kinda like that you didn&apos;t really recognize me as G-Eazy, but as Gerald. I get so many fake friends because of who I am, but I&apos;m not gonna get into that. I kinda already told you six month ago." He joked referring to the first encounter you had with each other.